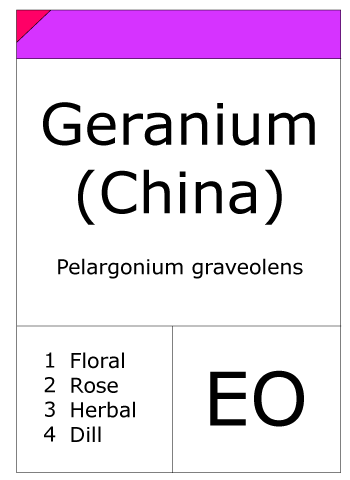 Pelargoniums are from South Africa. 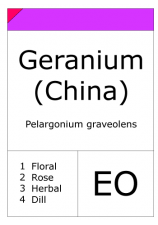 Geranium oil is obtained by steam distillation of the leaves of the flowering herbs of Pelargonium graveolens, P. roseum, and other hybrids that have developed into different ecotypes in different geographical regions. The leaves are covered with glandular hairs containing an essential oil somewhat resembling rose oil. 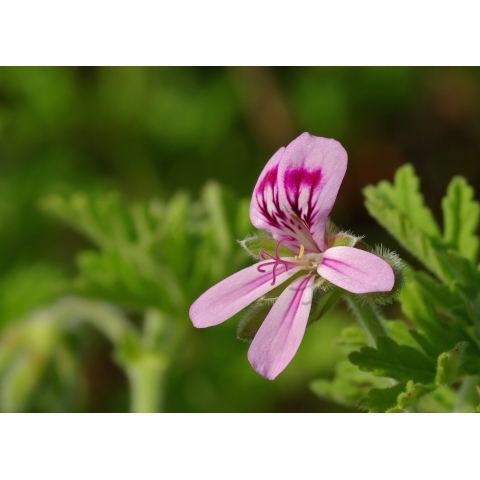 Geranium oil is one of the most important essential oils in perfumery. The main cultivation areas are Reunion and Madagascar (Bourbon type), Egypt (North African type), and China. The Bourbon oil is the most valuable. It has a very powerful, green, leafy-rosy odour with a pronounced fruity-minty undertone and a rich, long-lasting, sweet-rosy dryout. The amount of oil by steam distillation is as low as 0.15 %, but geraniums grow fast and the crop yield is substantial. The oil contains about 80 % of equal parts of (-)-citronellol and geraniol along with smaller amounts of the corresponding formates and tiglates. Other components that are present in amounts > 1 % are, e.g., (-)-linalool, cis-rose oxide (having an extremely diffusive, green-rosy, slightly metallic odour), (-)-isomenthone, furopelargone, and citronellyl diethyl amine (imparting a special floral odour with a slight quinoline-like undertone). The Bourbon type is characterized by high levels of (-)-6,9-guaiadiene. Geranium oil has wide applications - from soap perfumes, a famous example being the highly scented Spanish Maja soap (Myrurgia 1918), to luxury perfumes, Youth-Dew (Estee Lauder 1953), for example.